The Eugene, Cascades & Coast region is known for its gorgeous parks, playgrounds and natural public lands. 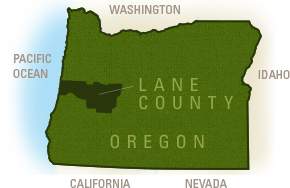 Sections of three national forests, the Willamette National Forest (which includes the Three Sisters Wilderness Area), Umpqua National Forest and the Siuslaw National Forest (which contains the Oregon Dunes National Recreation Area), lie within this region. State, county and city parks abound, providing public access to lakes, rivers, hot springs, ponds and marshes, beaches, forests, fields and other natural preserves. Depending on the park, you may need to obtain a park pass or permit in advance. Recreational activities available in many regional parks include hiking and equestrian trails, jogging paths, disc golf, skateboard parks, community gardens, manicured gardens and arboretums, kid play areas, picnic facilities, swimming pools and sports fields. Many area parks offer interpretive centers, volunteer opportunities, robust recreational and community programs, and are available for event rentals like weddings, parties and meetings. Community festivals are held in park amphitheaters, and community sports are held on park fields and in open spaces. Many parks are wheelchair accessible, offering paved trails through lava fields and up to waterfall viewing platforms.